Dr. Jeff J. Mollins has been practicing in downtown Brooklyn for over 25 years. He specializes in the diagnosis, treatment and documentation of injuries sustained by patients involved in all kinds of accident. These accidents include car accidents (no-fault), people injured at work (workers compensation), slip and falls and construction accidents. Dr. Mollins’ method of treatment for these injuries initially is a conservative approach. For example, initially injured patients will start their treatment with a regimen of chiropractic spinal manipulation augmented by physio (physical) therapy and exercise. Various medications (anti-inflammatory or pain medication) can be prescribed by referred specialist to further enable our patients to achieve wellness. Once conservative care has been attempted (usually after approximately 3 months of treatment), and proven ineffective or partially effective, other more aggressive options may have to be considered. One of these options is a specialty known as pain management. If a patients condition does not respond well to conservative care than Dr. Mollins will refer his patients to a quality, compassionate, doctor of pain management. Pain is defined as an unpleasant sensory and/or emotional experience associated with actual or potential tissue damage or described in terms of such damage. Pain is actually a message sent along the nerves to let the brain know that something is damaging the body. The brain responds by sending a message to the muscles or organ to take action. In the medical world all pain is divided into two categories; acute pain and chronic pain. Acute pain is temporary, and goes away quickly. It is useful, since it usually warns you of source of harm and tells your body to protect itself while it’s healing. Chronic pain is a pain that is unpleasant and last for prolonged periods of time. 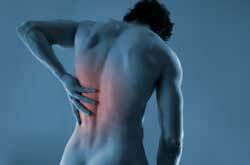 Generally if you’ve been experiencing pain in the same place for three months or more, the pain is likely to be classified as chronic. It is this type of pain (chronic) which has failed to respond successfully to conservative care that is typically treated by a pain management doctor. Radio Frequency Lesioning – a procedure that sends radio waves (heat) through a needle to damage small sensory nerve endings and interrupt pain signals. Spinal Cord Stimulation (Permanent) – this is for patient’s suffering from Complex Regional Pain Syndromes (CRPS) also known as Reflex Sympathetic Dystrophy (RSD). Joint Injections – joint injections of the extremities such as the knees, shoulders, hips, etc are used to treat the pain that comes most commonly from arthritis. Trigger Point Injections – (TPI) is used to treat extremely painful area of muscle. Platelet Rich Plasma (PRP) Injections – is an injection of a concentrated mixture of a patient’s own blood. PRP injections have been shown to relieve acute and chronic pain and accelerate healing of injured tissues and joints. Sacroiliac Joint Block – is an injection procedure used to diagnoses and treat low back pain associated with injury or disease to the sacroiliac joint. YESS Selective Endoscopic Discectomy – this minimally invasive procedure is performed through a small tubular device. It is designed to relieve pain caused by herniated discs pressing on nerve roots. Epidural Steroid Injection – is a procedure where numbing medicine (anesthetic) and anti-inflammatory medicine (steroid) is injected into the epidural space to treat pain caused by irritation of the spinal nerves. In addition, our referred pain management doctors (just like all of our referred specialists) are experts at documentation of all injuries. Our referred pain management doctors provide accurate and timely reports. They are certified by New York State to treat Workers Compensation patient’s. So if you are hurt at work, you can be treated for free (treatment is covered by the Workers Compensation insurance carrier) and receive compensation for your lost wages if unable to work. When you return to work, you can still receive treatment at no cost. All our referred doctors of pain management are skilled at preparing the paper work and billing properly so that our patients may receive there needed compensation in a timely manner. Dr. Jeff J. Mollins, with 25 years of experience, understands that some patient’s may require the services of a quality, confident pain management doctor. Dr. Mollins’ goal is for his patient’s to achieve maximum health.